ALL SALES ARE SOLD AS IS AND ALL SALES ARE FINALE … IF YOU BID YOU ARE EXCEPTING NO RETURN POLICY IF THEIR IS A PROBLEM PLEASE CONTACT ME ,I WILL DO MY BEST TO WORK WITH YOU. So, why did I do it? I had some eBay Bucks to use before they expired so I starting looking for well-priced, interesting items. 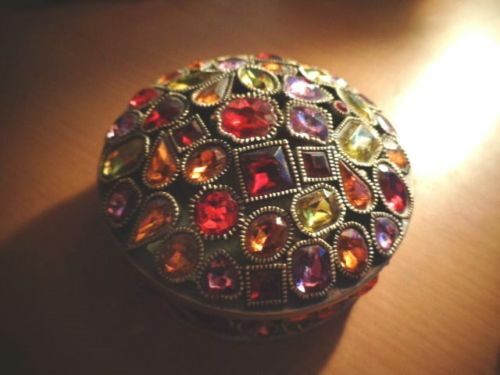 And I found this little box with semi-precious stones. Sweet right? In a slightly garish, blingy, handcrafty way! Moral of the story: Some rules are made to be broken! At least that’s what I’m saying this week!! Happy 4th of July and happy hunting.